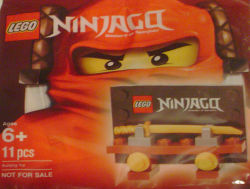 4636204 Ninjago Toys 'R' Us promo is a promotional set from a LEGO event at Toys "R" Us on December 11, 2010 from 12-2 pm. The event also included a free 4617163 Ninjago Eyes Sticker and a free Ninjago Headband. During the event, the game Spinjitzu was available for demo. People could mix and match weapons and then fight in the small battle arena from the 2257 Spinjitzu Starter Set. When the sets were released on January 1, 2011, you could use the set 2520 Battle Arena instead. The leftovers were given to people who bought LEGO sets at Toys 'R' Us. The set contains a weapon display that holds a Ninjago ninja's sword. This set includes a golden katana and an exclusive black Ninjago back panel. The back panel says "Ninjago Masters of Spinjitzu" in Japanese font. The set features SNOT building techniques that allow it to have gold details and still attach to the back panel. Facts about "4636204 Ninjago Toys R Us promo"
This page was last edited on 12 January 2016, at 20:45.